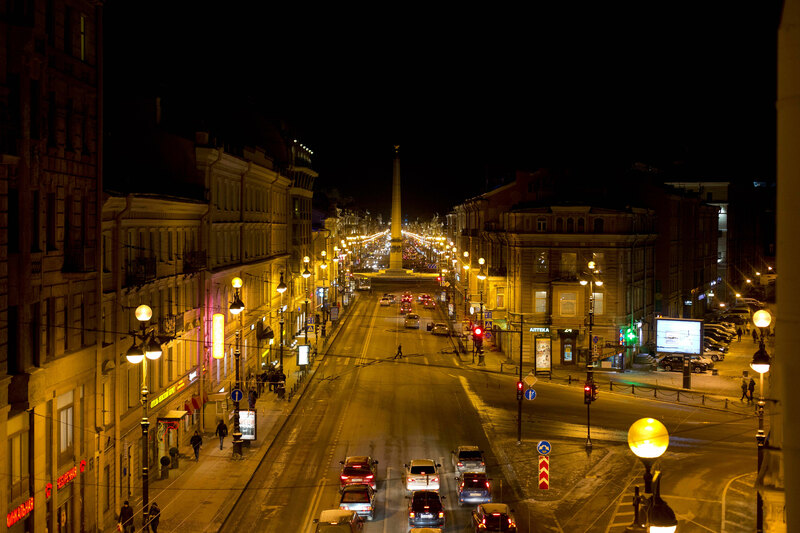 When I got out of the train, it was already dark in Saint Petersburg. The train trip had lasted only three and a half hours, and Russia in the north didn't feel too different from Finland. It was a little colder than Vantaa, but except for the big number of people in uniform, the even larger number of women of all ages wearing fur coats, the Cyrillic letters, and the vast range of expensive to cheap cars, the differences didn't seem to be too shocking. In my head swirled all the warnings of people from Russia who had drawn the picture of a wild and ruthless country. Here, however, I found nothing wild or even reckless (not even the traffic!). I had already downloaded a city map. My Russian app told me exactly where I was. However, I first had to find an ATM. As I got out at the end of Станция Санкт-Петербург-Финляндский (Finnish railway station), I walked around the station, through the security check at the main entrance (yes, they check you like at the airport) and picked up my first 2,000 Rubles. I thought this amount would keep me afloat for a while. I wasn't sure how the exchange course was but felt safe because the ATMs operated with the same interface as anywhere else. During my short walk around the station, I had already seen the entrance of the metro. I knew where I was going next. I didn't strictly know how to get to my AirBnB, but whenever I took a step forward, the next step revealed itself in the distance. The Metro had its rules, which I, fortunately, was able to guess at easily. Without having to turn to one of the ubiquitous uniforms I understood what I would have to do and where I had to go. At small sale booths so-called "tokens" were sold. They were small plastic plaques, which one inserted into the machine that separates the crowd. There were no tickets. The sale happened incredibly fast. We didn't even exchange words (so relieved). Most of the people around me made me think of the movies that had shaped my idea of Russia inadvertently. Film villains and vagabonds. This reading of the situation made me cringe. I will have to wait for my stereotypes to readjust to this new environment. Unhindered, I slid down the escalator and into the palace of the people. The women were mostly wrapped in fur coats and old worn out clothes. The young girls, however, dressed differently. Some of them could be straight out of a Parisian fashion magazine; very different idols influenced others. The Russians that are so noticeable in Germany (sharply styled, painted and walk around with operated noses and lips) exist as well. They are sitting next to ordinary people in the metro, and thus another prejudice evaporates with my first subway ride. Riding the metro here is a pleasant experience. It's spacious, eery and beautiful. It's unlike anywhere else. The Tube in London is claustrophobic, the Métro in Paris is only just marginally interesting, the subway in Germany doesn't compare. Below the ground truly is a palace. My AirBnB is located near the Московский вокзал (Moscow railway station) in one of the palaces on the Невский проспект (Nevsky Prospekt). It is a flat built in the rooms of a former palace which sometimes creates strange layouts. The extremely high ceilings preserve the palaces atmosphere, and the design of the unit tells the tale of the days of the revolution. From my balcony, I can see the obelisk. It's a nice perk. 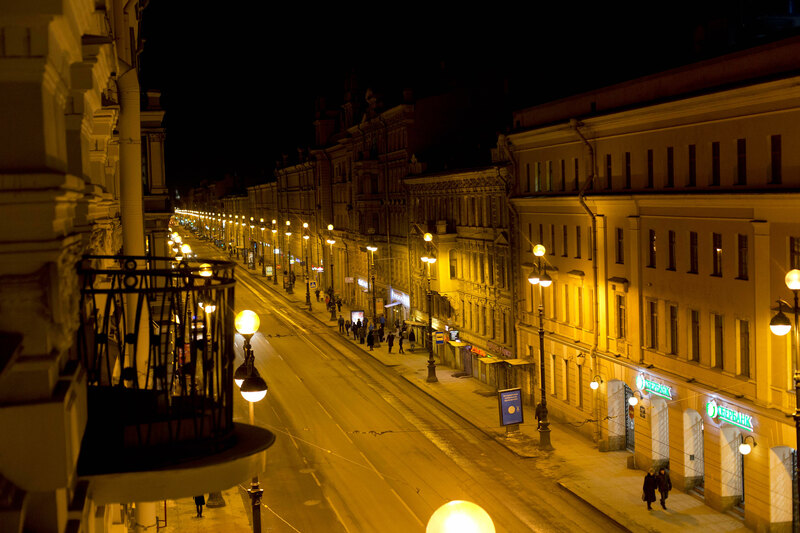 After a small photo session, I end my first evening in Russia with tea in hand and my Finnish wool socks at my feet, standing on my balcony at -20 degrees. My feet are cold, and my breath hangs in the air. Some time after and mostly confused, I press my head into the pillow and sleep with the noise of the big city carrying me into the night.